Are you always under time pressure in meeting your production cycle deadlines? 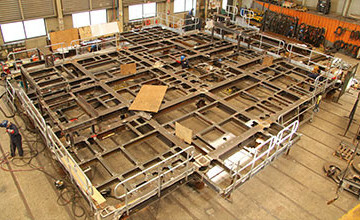 How are you dealing with ever-increasing demands on welded structural design? More and more offshore fabricators find the answer to solving the highly deadline-driven production challenges in automating their cutting process. Through automation one gains better control over and speeds up the fitting and welding processes. Introducing CNC-controlled weld preparations also helps in meeting the increasingly stringent quality and welding regulations. We have the cutting machinery capacity to realize 100% of the common offshore cuts, including rat holes, thus giving you complete freedom to design project specific connections. We cut your material on our high-performance plasma cutting line which reduces greatly the amount of grinding work needed after cutting. 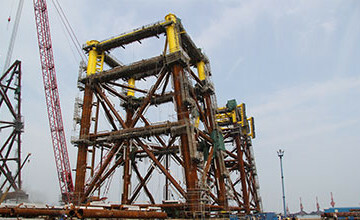 Our pipe cutting machines and services posses multiple features for optimizing offshore fabrication. Features, such as seamless interfacing with your CAD systems, 3D programming of weld parameters such as root-opening and shrinkage and cutting routines with variable weld transitions according to the American Welding Society (AWS), are all enabling you to fabricate fast and highly accurate.